Enjoy the breathtaking views and scenic stops along the beautiful Sea-To-Sky Highway. You get a sense of the vastness of British Columbia and its beauty. Feel the mist of the spectacular 335-meter Shannon Falls. There are black bears in the region, so there’s a good chance that you’ll see one. When you get to Whistler, there is ample time to dine, shop, take the Peak 2 Peak gondola, ride a bike or stroll the trails. 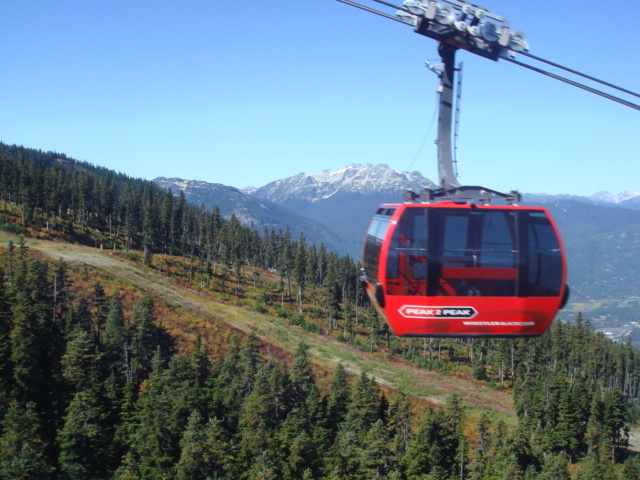 Ride the Gondola to the peak of Whistler Mountain and experience the area where the 2010 winter Olympics were held. Enjoy glacier, mountain and river views on your leisurely ride home. or Email us or call 604-990-9299 or 800-913-9207 for more information and reservations. For the Whistler Bus & Float Plane Tour, you have the opportunity of either taking the bus to Whistler and flying back, or flying to Whistler and returning to Vancouver by bus. If you choose the drive up first, the tour begins with an 8:30 AM pick up from your Vancouver hotel in a comfortable 24 passenger bus. The trip begins by crossing the Lions Gate Bridge and heading through West Vancouver, Horseshoe Bay, Lions Bay, Porto Cove, and Britannia Beach to Squamish. The beautiful Sea to Sky Highway is the road to Whistler, where the 2010 Olympics were held. You’ll get to visit Shannon Falls, the 3rd highest waterfall in BC. 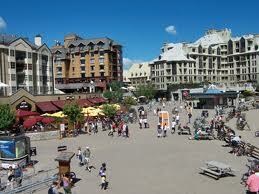 When you’ve arrived in Whistler Village, your driver will provide an orientation of the area and will give you suggestions about things to see and do in Whistler during your free time. You may want to try zip lines, hiking, walking, or shopping. You might also want to sit in the patio of one of Whistler’s great restaurants, have a great lunch and watch the world walk by. The Peak 2 Peak gondola is on most visitor’s minds when they look up the mountain. On your return trip, the float plane will take off from Green Lake at 7:00 PM and land at Vancouver’s inner harbour 45 minutes later. This is truly a wonderful experience and very fun! If you choose to take the float plane first, your flight departs at 9:00 AM, and after a beautiful scenic flight, you’ll land on Green Lake at 9:45 AM. A free shuttle will drop you off in Whistler Village where you’ll have free time to explore before being picked up between 3:45 and 4:00 PM for your bus ride back to Vancouver. The bus driver/guide will make your trip interesting and informative.